Financial assistance from the State of Bavaria, supplemented by European, national and other funds, gave a chance to redevelop the glass museum with a new, up to date architecture and concept. From 1999 the cultural scientists Dr. Katharina Eisch-Angus and Dr. Jörg Haller were commissioned to develop an overall concept and to coordinate its realisation. Shortly before, the architectural office "Architekturschmiede Kirchdorf" had started their planning. On ca. 1100 square meters of floor space, they developed, from 1999 to 2005, a multi-layered, scenic permanent exhibition, which would be brought to view in a new, architecturally dynamic circular building. The new museum did not only aim towards presenting its collection of glass objects, made in the glass regions of the Bavarian Forest, Europe and the world. Based on the amalgamation of architecture, exhibition contents and interior design, and of integrating the glass exhibits into their human and societal contexts a holistic “work of art” was created, - an ethnographic museum with exemplary character. The basis for the new museum was found in local and regional funds of knowledge, collections and archives, both locally and in the Czech partner cities and museums of Nový Bor, Kamenický Šenov, Sušice, Kašperské Horý, Prague and others, in addition to comprehensive new research by the concept team. The concept was realised in close cooperation with the planning offices, especially the architects Oswald (“Architekturschmiede”, of nearby Kirchdorf i.W), and the interior architect Stefan Haslbeck from Fulda. Many others co-operated and joined their potentials around the Glass Museum: Over 20 international and regional artists transfered the zeitgeist of European historical epochs into exhibition displays constructed in glass. Glass makers contributed their stories and life experience, as well as their technical and work expertise; the glass companies donated historical exhibition objects such as materials, tools and machines from their work processes and executed display elements from glass. Museum director Karin Rühl developed the concept for the exhibition area for modern studio art glass as well as of the study collection, texts and research are in co-operation with Suzanne Beeh-Luistenberger and Barbara von Malotki. A wide network of institutions and private enthusiasts, including museum founders Alfons Hannes, Helmut Schneck und Erwin Eisch, engaged with their knowledge, with objects and materials. The new Glass Museum Frauenau was opened on June 10, 2005. In April 2006 the Bavarian-Czech and the international glass world, artists and glass blowers, schools and glass companies gathered in the Glass Museum for the great International Glass Symposium "Glass in Context: Art - Image - Industry". 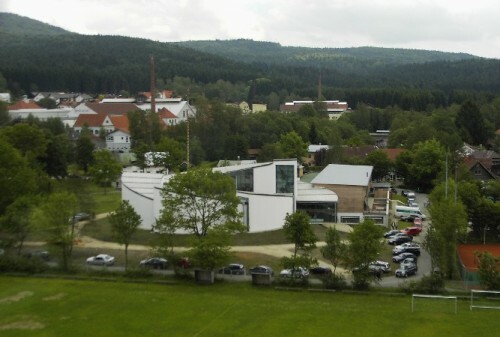 On January 1, 2014, the Glass Museum Frauenau, fort its exceptional public and scientific significance, its unique concept, and its role for the glass identity, was adopted as a Bavarian State Museum.